Cameron and Rebecca Stern fill sterling silver molds with "specimens" engineered to induce joy. I purchased these earrings for my college aged daughter. She loves them! Sadly, she lost one (and felt very bad about it) so I purchased a 2nd pair. They are perfect for a non-flashy young woman. I really like the look of these earrings. I wear them quite often and have received a few compliments. I just wish they were a tad bit larger. My niece really loves these! Great for school and goes with a lot. Really sweet and cute. 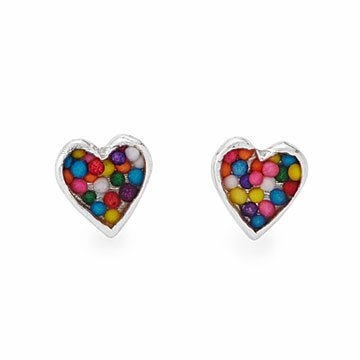 These sweet little candy hearts will not disappoint! A Christmas gift for my 13 yr old daughter but I may have to borrow them! My 12-year-old granddaughter lives in Australia, so we don't see each other in person very often. But I know she loves ice cream and frozen yogurt with sprinkles. After she got the earrings, I sent her the story of the artists from your catalog, which made the gift even more special. Wear them at work to remind myself of my true love: baking cute and delicious treats.